Archives : MARCH TOWARDS THE TOP CONTINUES - 28/02/2014. MARCH TOWARDS THE TOP CONTINUES – 28/02/2014. It was a show of strength by the Bulls for the second week running as they continued its march towards the previous top. The signs are ominous, as the Bulls last week filled the first bearish gap and this week the more critical second bearish gap. A weekly close above the second bearish gap is very significant as this gap also holds the 61.8% Retracement level. As a result the prior uptrend has resumed and even the medium term trend has turned upwards. Sensex opened the week at 20695, made a high of 21140, low of 20637 and closed the week at 21120. Thus it registered a weekly gain of 420 points. At the same time the Nifty opened the week at 6140, made a high of 6282, low of 6130 and closed the week at 6276. Thus the Nifty closed the week with a gain of 121 points. On the daily charts, both Sensex and Nifty have formed an Opening White body Marubuzo which suggests continuation of bullishness in the short term. The weekly charts have formed a big white body candle for the second week running. Thus candlestick study suggests that the daily as well as weekly bias is bullish. This week, the market overcame the critical second Bearish Gap between Sensex 20899-21123 and Nifty 6188-6263 which holds greater significance as it matches with the formation of weekly Bearish Gap i.e. Sensex 20899-21001 and Nifty 6188-6243 and the 61.8% Retracement (Sensex – 20902 and Nifty – 6231) of the recent fall. A weekly closing above this Resistance zone has opened the doors for the market to test the previous top. This week, both Sensex and Nifty managed to close above the medium term average of 50dma (Sensex – 20802 and Nifty – 6183). Both the indices continue to stay above the short term average of 20dma (Sensex – 20520 and Nifty – 6098) and the long term average of 200dma (Sensex – 20086 and Nifty – 5987). Thus the trend in the medium term has turned positive while the trend in the short and long term timeframe remains bullish. MACD and ROC are both positive and continues with its Buy signal. RSI (63) suggests strong bullish momentum. MFI (85) has moved higher into the overbought zone, suggesting that the market might see some profit booking from the current levels. Stochastic Oscillator continues in Buy mode as %K (96) remains above %D. ADX (21) has reduced, suggesting that the downtrend has lost its strength. The Directional Indicators have given a Buy signal as +DI has gone above -DI. OBV has moved higher and crossed the previous intermittent top, giving a Buy signal. Nifty closed above the upper Bollinger Band on Monday, giving a Buy signal. Thus Oscillators suggests positive bias in the near term. The Nifty O.I. PCR has reduced to 1.10. For the March series, highest Open interest build up is at 6100 Put and 6300 Call. This suggests that the market expects a small trading range with support coming in at 6100 levels and resistance around 6300 levels. Friday saw strong put writing at the strike of 6200 level which is likely to act as an immediate support. The Trendline Resistance for the Sensex is at 21350. The Trendline Support for the Sensex is at 20383. The Trendline Resistance for the Nifty is at 6307. The Trendline Support for the Nifty falls at 6069. 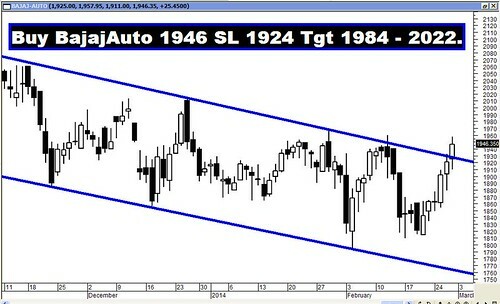 For the week ahead, Sensex will find Support at 20828-20516-20149 and will find Resistance at 21409-21693-22048. For the week ahead, Nifty will find Support at 6188-6085-5984 and will find Resistance at 6358-6471-6584. All the recommendations given in the previous week did well and reached their targets except for JsW Steel. But the Star performer of the week was PFC which went up by more than 8%!! !